From microscopes to nuclear imaging scanners, imaging technology is growing ever more vital for the world's hospitals, whether for the diagnosis of illness or for research into new cures. Imaging technology requires dyes or contrast agents of some sort. Current contrast agents and dyes are expensive, difficult to work with and far from ideal. Now, Danish chemists have discovered a new dye and proved its worth against the dyes currently available. Thomas Just Sørensen and Bo Wegge Laursen are researchers of chemistry at the University of Copenhagen. In a series of publications found in well-regarded scientific journals, They have shown that aza-oxa-trangulenium dyes have the potential to outperform all fluorescent dyes currently used in imaging. "Our dyes are ten times better, far cheaper and easier to use! “Our dyes are ten times better, far cheaper and easier to use. The latter I believe, lends itself to expanded opportunities and broadened use, by physicians and researchers in developing countries, for example.” Says Thomas Just Sørensen. It might seem odd, but one of the central challenges when imaging cells and organs, is to avoid noise. The agents that make it possible to see microscopic biological structures are luminescent, but then, so is tissue. Consequently, the contrast agent’s light risks being overpowered by “light noise”. Just as the dial and hands of a watch might glow in the dark, tissue becomes luminescent when exposed to light. Tissue and other organic structures luminesce, or lights up, for 10 nanoseconds after exposure to light. The light-life of an ordinary dye is the same – 10 nanoseconds. But triangulenium dyes produce light for an entire 100 nanoseconds. The long life of the triangulenium dyes means that an image can be produced without background noise. Furthermore, the extra 90 nanoseconds mean that we can begin to deliver a living image of the processes occurring within cells, for example when a drug attacks an illness. Medical image analysis departments currently devote an incredible amount of time to staining samples, because all samples must be treated with two agents. The use of triangulenium dyes necessitate only one dye. And in contrast with typical dyes, no specialized equipment is needed to see the dyes in tissue samples. A lens from a pair of polarized sunglasses and an ordinary microscope are all that are required. When one compares the advantages of triangulenium dyes against the three million Danish kroner per gram price tag of traditional dyes,(500.000$US)(320.000£) you would expect that the new dye would immediately out-compete its predecessors. However, up to now Sørensen and Laursen have had to give the dye away. “I know that our dye is better, but biologists and physicians don’t. Therefore, We are giving the dye away to anyone that wants to perform a comparison test. Someone who needs to assess the health of sick people, wouldn’t dare to rely on an untested substance. 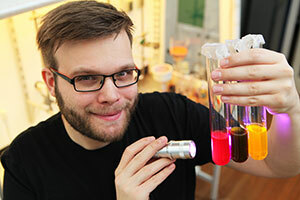 Only when several researchers have shown triangulenium dyes to perform just as effectively as its predecessors can we hope for our substance to become more widely adopted,” concludes Thomas Just Sørensen.